As the guests arrived they were invited to have some refreshments before going into the dining room for tea. Louise our hostess had something for everyone. Champagne, Wine, Sparkling Cider and Sh﻿erry. Salted nuts in the autumn leaf. Louise's home is absolutely beautiful. This Fall arrangement is so beautiful on her table top. As the guests enter the dining room they see the sideboard with delicious sweets for dessert. A beautiful flower arrangement and beautiful antique dishes galore. As I'm writing this post I discovered that I did not ask the name of the beautiful Sterling Sliver Flatware. Louise did tell me some of the dishes belonged to her mother who is now 98 years young and some of the dishes belonged to her mother-in-law and most of the dishes Louise has collected over the past 40 some years. This dessert plate, cup and saucer are 100 years old. I did remember that interesting piece of information!!! I just went from one place setting to another looking at each piece in awe. Open-Face cucumber sandwiches and Putting on The Ritz Egg Salad Sandwiches were served﻿. Louise is Canadian and on her last trip home she bought the lemon curd hoping for a special occasion to use it. The strawberry jam is wonderful imported French jam we can buy in some grocery stores in the the United States. It has the best flavor when spread on a scone. Butter and whipped cream were also served. The perfect centerpiece. So lovely and didn't block any guests view. 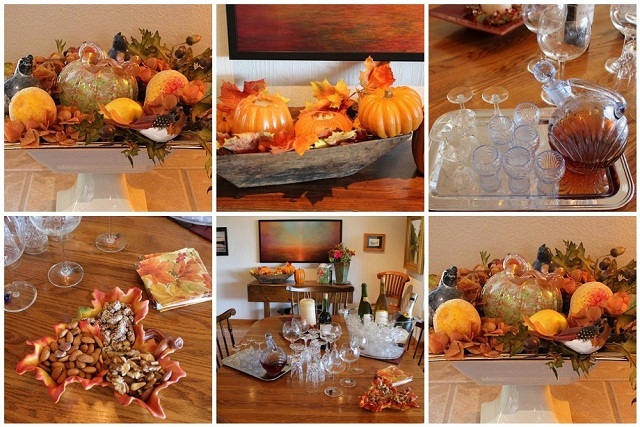 Gorgeous fall decor! Your table looks great. Love those warm fall colours. The decor says "Welcome dear ones". I especially like the different china patterns and the linen/lace place mats. What a wonderful Friendship tea! The place settings with the tea cups are gorgeous. The fall decor ... lovely. Everything looks perfect. What fun you must have had being part of this tea. Happy Tea Day! OH so beautiful! Love everything! What a lovely tea! Everything looks marvellous from the beautiful china to the food. What a treat to partake of it with friends. Thank you for sharing. It's been delightful. Wow, what a beautiful array of china. Everything is just so lovely. I like the sherry decanter, very unique. Oh my dearest lady, Betty! I am so inspired I can varely contain my enthusiam for the lovliness you have laid before us! 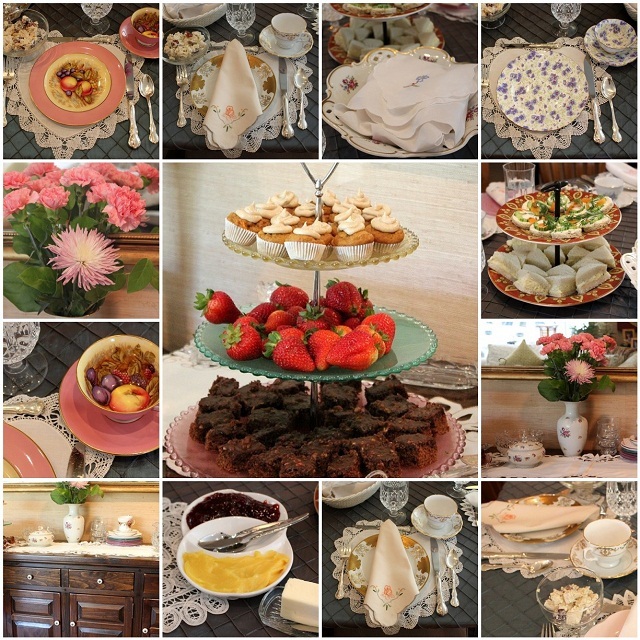 I just adore each and every exquisite detail, from the delicious looking food, to the food presentation, china, flowers, lace, silver, crystal and really every detail are second to none!.., Not to mention all of the dear, happy, smiling faces of the ladies who were so blessed and privileged to be invited to your delightful friendship tea. ~ Quite simply unforgettable! Happy Tuesday tea day and have a marvelous week! What a beautiful tea. Your friend has some gorgeous things. Love that 3 tier server. What a wonderful celebration of friendship, Betty! It is obvious that both you and Louise put a lot of thought and time into creating this lovely event for your guests! I really like the pintuck table linen!!! Betty, Thanks you for sharing your friends lovely home at the Open House party. She put together a beautiful tea for the ladies.